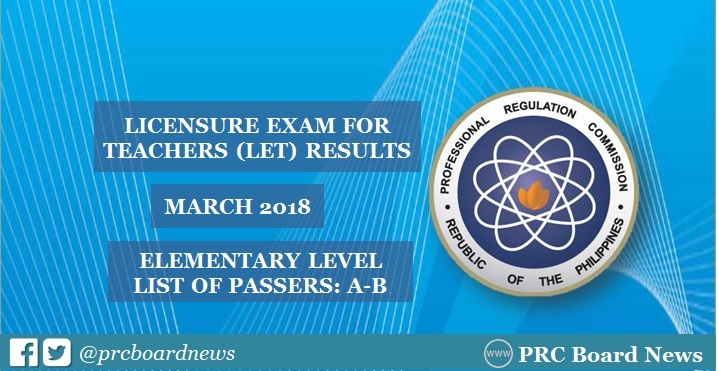 MANILA, Philippines — The Professional Regulation Commission (PRC) and the Board for Professional Teachers (BPT) officially released results of March 2018 Licensure Examination for Teachers (LET) on Wednesday, May 23 or forty (40) working days after the test. The alphabetical list of passers (A-B Surnames) is available on this page once announced online. UPDATE: PRC announced that 13,774 elementary teachers out of 58,323 examinees (23.62%) passed the LET. It is further announced that of the 13,774 elementary teacher passers, 4,360 are first timers and 9,414 are repeaters. PRC administered the first LET board exam this year on March 25, 2018 in at least 20 testing centers nationwide: Manila, Bacolod, Baguio, Cagayan De Oro, Catarman, Cebu, Davao, General Santos, Iloilo, Kidapawan, Legazpi, Lucena, Occidental Mindoro, Pagadian, Palawan, Romblon, Rosales, Tacloban, Tuguegarao and Zamboanga. PRC and the Board of Professional Teachers said that in order to pass the March 2018 LET, an examinee must obtain an average rating of not less than 75% and must have no rating lower than 50% in any of the tests. According to PRC Resolution No. 2017-1068, which deals with the 'Schedule of Licensure Examinations for Year 2018, the target release of March 2017 LET results is on Tuesday, May 22, 2018 or in 37 working days after the exam. In March 2017 LET, results were released in forty (40) working days after the exam. A total of 5,600 elementary teachers out of 53,915 examinees (10.39%) and 18,482 secondary teachers out of 72,584 examinees (25.46%) passed the exams. March 2016 LET results were announced in forty-one (41) working days. A total of 12,128 elementary teachers out of 42,739 examinees (28.38%) and 18,810 secondary teachers out of 53,090 examinees (35.43%) successfully hurdled the one-day exam.